It was a very interesting article, and I'm looking into it further. Brendan Casey is an expert in hydraulics design, troubleshooting, and maintenance. In this particular article he mentioned three ways of removing water from hydraulic oils, preventing the expense and environmental concerns associated with frequent oil changes. Polymeric filtering is a process which employs a filter designed to absorb water. The filter media will quickly saturate, however, making it useful for removing only small amounts of water from the oil. Polymeric filters simply replace the conventional screw-on filters we currently use. Vacuum Distillation is a process in which a vacuum is applied to the hydraulic sump. Water will boil at 133 degrees Fahrenheit (56 degrees c.), when a vacuum of 25 inches mercury is applied. Since the applied vacuum allows water to boil at such low temperatures, no heat damage is done to the oil or its additives. This method also removes dissolved moisture. Headspace Dehumidification is accomplished by pumping the headspace air through a dehumidifier. For most of us here, the most promising method seems to be the use of Polymeric Filters. I've got some investigative work to do on this subject, unless someone here knows which companies supply Polymeric Filters for the compact tractor market. You could drain the fluid into a large container with a valve at the bottom, let it settle, and draw off the sunken water. As for disposing of used fluid, it makes a good vehicle undercoating spray. Joel, I bought a spin-on Poly for my fuel transfer tank from NAPA. About $30. And it does swell to the point almost no flow. I would be wary of installing one to replace a machine's primary for fear of cavitation or blowing the filter apart. My pump is a manual push-pull and I could barely operate it when fully saturated. I have the same concerns. However, it is clearly stated that these Polymeric filters are designed to remove very small amounts of water from the hydraulic oil. If a person knows they have water in the oil......and more than just a little.......some other method would have to be used to remove it. Either that, or simply drain and replace it. 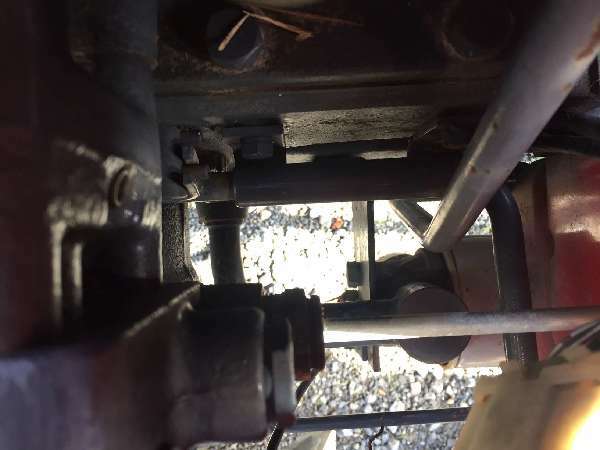 We've recently seen several people report problems with their hydraulic systems due to a combination of moisture accumulations and cold weather. A filter, like this, installed long before the moisture levels get too high, might be a preventative measure to consider. It wouldn't serve as a corrective measure, however, due to the problems you encountered. I don't believe a plugged filter would result in pump cavitation, due to it being installed in the return line, back to the sump. In no case would I ever install one in the pump inlet line. There's a problem with all of these ideas. The 'hydraulic fluid' they are talking about is in relation to "fluid power" systems, i.e. hydraulically powered systems like presses, lifts, conveyors and other stationary type equipment. The hydraulic fluid they run is not the same as that in a hydrostatic drive system. The principle difference is in the detergents and additives. The fluid we run in a tractor is designed to absorb water and keep it in solution. The 'regular' hydraulic fluid is not. Although if you do leave the fluid long enough it will seperate, it takes a long time. It would be easier, and a LOT cheaper, to just leave it to seperate then either use an immersion type desiccant like those sold to absorb the water from the fuel tank of a snowmobile, or merely skim or pump it as Auerbach suggested.